In the Talking Tuboungus activity, students make music with drum language from the Congo — please also see my introductory page on Drum Language of the Congo. Your students learn three actual Lokele phrases: 1) Log from the Bolondo tree, 2) Moon looks down at the earth, and 3) Up above there in the sky. Next, they combine phrases, as the Lokele do, to construct meaning from their language. The students begin by saying each phrase in Lokele, then playing each phrase on homemade Tuboungus. In addition to Tuboungus, Phil suggests a variety of popular classroom instruments that can also be used for this activity — please see below. In the Talking Tuboungus activity package, Phil and Sarah provide you with everything you need to present an interactive musical program that also compliments your school’s standards-based Language Arts curriculum! Phil includes the same music and visuals he uses when he presents this activity at his popular Rhythms of Language family nights. During his family nights the students make their own homemade Tuboungus, and then sing and play actual Lokele phrases from the Congo! You also get Phil and Sarah's step-by-step instrument making instructions, Phil's introduction on how to pronounce each Lokele phrase, and three versions of the music that you can play from your computer, or burn to disk using Windows Media Player or iTunes. Whether you're interested in a guided activity for a small group of students, or want to present an activity for the entire school, Phil and Sarah include everything you need to generate your visuals, make your instruments, play the rhythms, and successfully present the activity. It’s perfect for music teachers, class-room teachers, reading specialists, drum circle facilitators, or anyone else who has a love of language and rhythm! To download Phil and Sarah's complete package containing two PDF files and five MP3 files for the "Talking Tuboungus" activity, click the "Buy Now" button below. The Tuboungu is a homemade boungu made from PVC sprinkler pipe, cardboard from a cereal box, and duct tape. It produces an E and G — the two pitches we will sing and play. Phil also includes instructions on how to build Tuboungus that play the pitches C and D, so your students can create two-part harmony. Besides Tuboungus, there are many other instruments we can use to communicate phrases in a tonal language. On the continent of Africa, we find a variety of whistles, horns, and string instruments used for this purpose. With this in mind, let’s consider three popular classroom instruments we can also use. 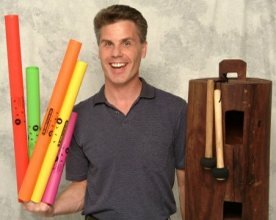 Boomwhackers® are an excellent choice. In this activity, the students play the tubes by lightly tapping them against their legs. 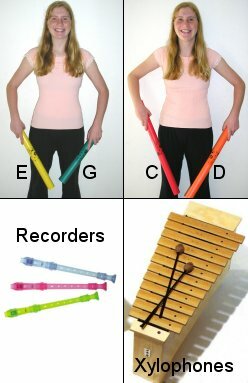 Recorders and Orff instruments also work nicely. They produce a beautiful sound and play all of the pitches we need for this activity. Book: The Talking Drums of Africa by John F. Carrington. The Carey Kingsgate Press; 1949. CD: Forest Music - northern Belgian Congo by Hugh Tracey. Sharp Wood Productions and International Library of African Music; 1952.